Taipei, February 28, 1947: As an uprising rocks Taiwan, a young doctor is taken from his newborn daughter by Chinese Nationalists, on charges of speaking out against the government. Although he eventually returns to his family, his arrival is marked by alienation from his loved ones and paranoia among his community. Years later, this troubled past follows his youngest daughter to America, where, as a mother and a wife, she too is forced to decide between what is right and what might save her family—the same choice she witnessed her father make many years before. 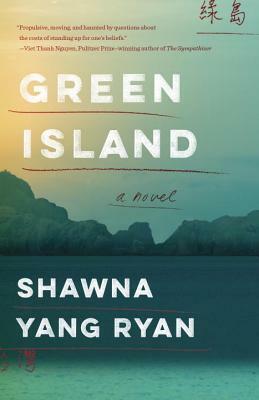 A stunningly lyrical story of a family and a nation grappling with the nuances of complicity and survival, Green Island raises the question: how far would you go for the ones you love? Shawna Yang Ryan is a former Fulbright scholar and the author of one previous novel, Water Ghosts; she teaches in the Creative Writing Program at the University of Hawai’i at Manoa. Her short fiction has appeared in ZYZZYVA, The Asian American Literary Review, Kartika Review, and Berkeley Fiction Review. She lives in Honolulu.